Improbable Escapes Inc. is Kingston's Escape Room & #1 Rated Fun Thing To Do. Not familiar with what an escape room is? An escape room is a physical adventure game in which players solve a series of puzzles and riddles using clues, hints, and strategy to complete the objective. Our games are fully immersive experiences, designed by set game developers and set designers. In this game, your objective is to find the antidote to cure zombies, and release it into the world to save humanity. Learn more below! The zombie apocalypse moved surprisingly fast. It’s been months since a nuclear accident created a mutated strain of the common cold, unleashing an undead epidemic that spread like wildfire. Billions are undead, society as we know it is gone, and the last survivors huddle in colonies where every day, the living learn to envy the dead. One by one, the last bastions of humanity are being overrun. But there are rumours of a cure. Wandering madmen, insane with desperation spread word of a research facility that might be mankind’s last hope, hidden in the most frozen reaches of the deadliest place on earth. You and your team are the human race’s last chance. Infiltrate the polar outpost, find the cure, and release it to save humanity. But be quick. Zombies eat your brain in 60 minutes. or email us at info@improbableescapes.com. If the booking system does not load, please click here to book online. 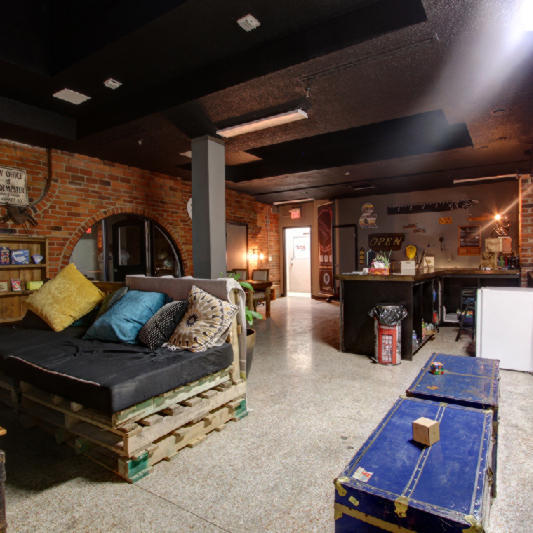 Improbable Escapes is located in the heart of downtown Kingston inside LaSalle Mews. Improbable Escapes has plenty of experiences that can suite any interest. We offer a family friendly game called Love Letter Lockdown, a horror game called Coroner's Report, and an action packed game called Legend of the Mayan Temple. Improbable Escapes is Kingston's Escape Room and #1 Rated Fun Thing To Do!